WASHINGTON (NNPA) — There have been so many former professional athletes in the news recently who have gone from rags-to-riches-back-to-rags again that they could form their own reality show. Future Hall of Famer Terrell Owens, for example, accumulated some amazing stats during his 15-year NFL career as a wide receiver: second in league history with 15,934 yards, tied for second with 153 touchdowns and sixth with 1,078 catches. Instead of talking about his on-field accomplishments, however, fans and sportscasters are talking about his interview with Dr. Phil in which he disclosed that he has lost all of his money, estimated to be between $80 million and $100 million. After falling behind in child support payments to baby mama Kimberly Floyd, a judge ordered T.O. to complete eight hours of community service, which he performed at a Los Angeles Goodwill store. Hundreds of other former professional athletes – including former Boston Celtic Antoine Walker, boxer Mike Tyson and track star Marion Jones – could be added to the list. And no matter how often their stories are told, we’re likely to see still more stories of personal and financial ruin. Let’s be clear: athletes who spend lavishly and regularly travel with as many as 50 freeloaders must accept direct responsibility for their current predicament. But they are not the only ones at fault in a system that routinely separates Black athletes from their community while they are still enrolled in college, steering them away from wives who look like them and White agents who don’t share their culture. What separates the exploitation of the Black athlete at the professional level, where Black athletes make up roughly 80 percent of the NBA and 70 percent of the NFL, is money. Big, big money. And big money in the hands of unsophisticated Black athletes is a train wreck waiting to happen, attracting agents, financial advisers and other professionals who view them as easy prey. In the typical scenario, a “qualified” agent lands a client and then quickly recommends a financial adviser. Or, vice versa. Maybe the pair recruits together. Maybe they just vouch for “their guy.” Maybe there are kickbacks. Maybe there is the expectation of future swaps. However it goes down, in the end, a player thinks he has two sets of independent, trustworthy eyes on his money when, in fact, he has none. How is it that well-paid agents and advisers are absolved of any responsibility and/or liability for their complicity in players’ financial fatalities? We read about Iverson’s financial problems with no mention of his agent, Leon Rose of CAA. We know about Terrell Owens’ money worries but Drew Rosenhaus, his “super agent,” isn’t held accountable. If you check the websites of major agents, they all in one form or another claim a “family-first” approach. The only family they put first is theirs. Because coaches and university boosters, most of whom are White, steer Black athletes to White agents, many Black agents – such as Angelo Wright, Al Irby, Alvin Keels, Kennard McGuire and Tony Paige – don’t get a fair opportunity to represent most Black athletes. My guess is that Black player agents represent less than 15 percent of all NBA and NFL players. According to Sports Illustrated, by the time former NFL players have been retired for two years, nearly 80 percent of them “have gone bankrupt or are under financial stress because of joblessness or divorce.” Within five years of retirement, approximately 60 percent of former NBA players are broke. By virtue of their numbers, it’s clear that Black agents are not leading a parade of Black athletes into bankruptcy or financial distress nor are they sitting by silently watching their clients commit financial suicide. The top 15 agents/agencies represent the majority of players, and practically all of the stars and superstars, including the two most amazing meltdowns in recent sports history, Allen Iverson and Antoine Walker, who reportedly lost a combined $320 million. The top agencies include Athletes First, BDA Sports, Creative Artist Agency (CAA), Excel Sports Management, Lagadere, Landmark Sports, Octagon, Priority Sports & Entertainment, Relativity Sports, Rosenhaus Sports, and Wasserman Sports Management, who collectively manage more than $10 billion in player contracts. Can you image what would happen if the tables were reversed? Suppose Black agents dominated 85 percent of the agent game at a time White players dominated the NBA and NFL and more than 80 percent of NFL players and more than 60 percent of NBA players were going bankrupt. Led by Fox News, there would be a public outcry, the appointment of a special commission and at least one televised congressional inquiry. The exploitation extends far beyond the playing field and basketball court. Take the case of the $1.2 billion Levi’s Stadium that is being completed with less than 1 percent of minority participation. 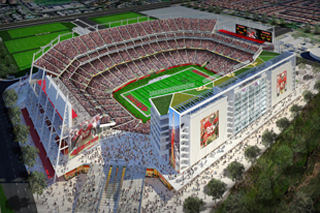 It will be the new home of the San Francisco 49ers, which has a roster that is 80 percent Black. Moreover, the stadium, expected to open in August 2014, will be located in Santa Clara County, where Whites make up less than half of the population. According to Fox News, in 2010, there were 10 NFL teams facing major stadium issues. If people of color received a share of the business constructing or overhauling the football facilities in numbers that approximate their representation in the local population, they could significantly empower their communities. If that practice were expanded to the NBA and Major League Baseball, the sharing of the economic pie more fairly could radically transform urban America.